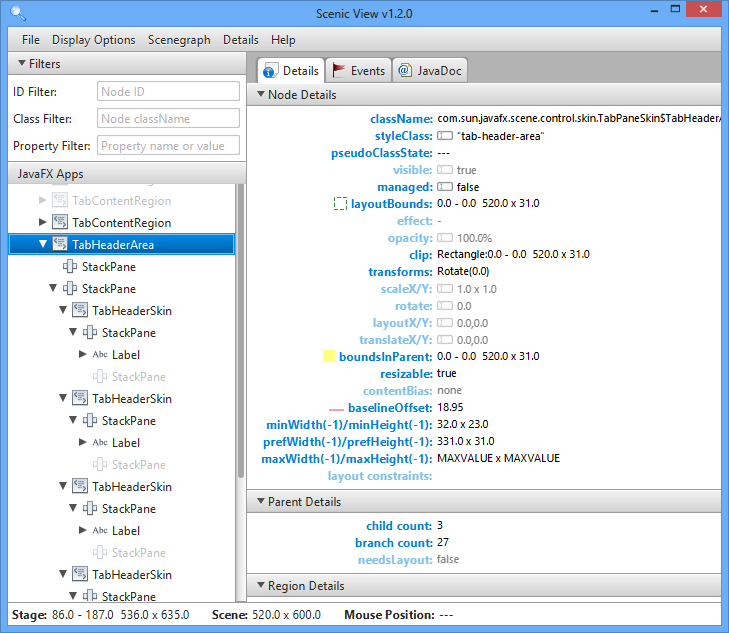 Just a really quick post about the availability of Scenic View 8.0.0 developer preview 4. This release is simply to get Scenic View working with the latest release developer preview builds of JavaFX 8.0. For those unfamiliar with Scenic View, here’s a short blurb: Scenic View is a JavaFX application designed to make it simple to understand the current state of your application scenegraph, and to also easily manipulate properties of the scenegraph without having to keep editing your code. This lets you find bugs, and get things pixel perfect without having to do the compile-check-compile dance. I’ve got a crash at startup. Try upgrading to a newer Java 8 build – b100 is a few weeks old now and b103 is the latest release. FYI, on b114 when DP4 of Scenic View is running, my application doesn’t terminate when its window is closed. If SV isn’t running the app does terminate when its window is closed. Explicitly setting Platform.implicitExit had no effect. I’m getting the same exception with JDK 1.8.0_05 on Ubuntu Linux. Is scenic view open source? If it is, where can I access the source code? Will the source code ever be open?